Thank you for your interest in volunteering for ASHE. As a membership organization, ASHE relies on volunteer participation to drive our profession forward. We know your time is important and your participation is appreciated. The My ASHE online community includes a volunteering section that allows members to contribute their time and talent. My ASHE makes it easy to identify your volunteer preferences and to participate in volunteer opportunities. Being part of the volunteer pool means that you are interested in learning about future volunteer opportunities available through ASHE. When you're opted into the pool, you will receive email alerts as soon as a new opportunity opens up that matches your qualifications and interests. Opting in is easy- with one click, you are added to ASHE's pool of volunteers. This means that when new opportunities come up, you'll be the first to learn about them. Once opted in, you can of course suspend your opt-in request at any time. Just set the Invite me to volunteer when opportunities match my expertise? toggle from 'Yes to 'No' on your volunteer profile to no longer receive invitations. Complete your Volunteer Profile so that we can connect you with future volunteer opportunities for which you are a good match. Check out the current list of volunteer opportunities! The full listing of volunteer posting is available through the Volunteer Opportunities List. By becoming a volunteer, you can also rack up “My ASHE Points,” earning you badges for your My ASHE profile along the way. 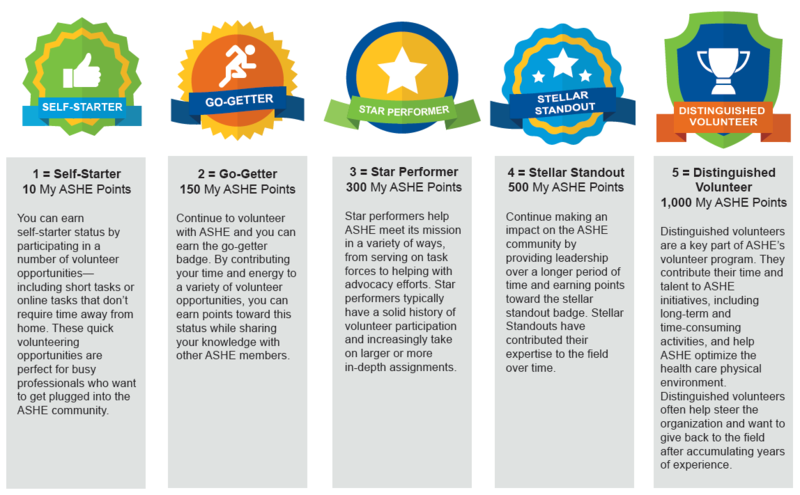 These points and badges are meant to be a fun way to track your level of engagement in ASHE’s volunteer program, and stir competition among friends. Learn more about each level below.